Want to buy massage chairs for less? If so, you’re in luck. In today’s article you’re going to discover six simple-to-implement tips that will help you to save money when buying your massage chair and end up spending much less than you otherwise might have. Sound good? It’s no secret that massage chairs can be expensive, with chairs such as the Inada Sogno Dreamwave costing more than the average family vacation. However for the more frugal-minded individual it’s entirely possible to spend considerably less and still end up with the home massage experience of your life. All you need to do is apply a few proven ideas to start whittling down the cost of buying a massage chair in 2016, 2017 and beyond. The first consideration for getting massage chairs for less than you could relates to features. 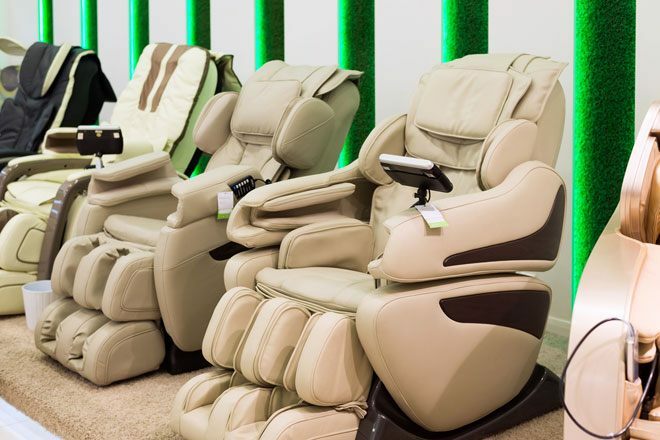 The reality of the situation is that the more expensive massage chairs cost more for a reason; quite simply because they’re stuffed to the rafters with all manner of high-end features. But do you really need these? For some people the answer will be “yes” – they’ll gladly pay more for a premium model knowing that the massage experience will be incomparable. Others, however, may not be so worried about chilled drinks holders, MP3 players, gentle lighting and a zero gravity recline feature. If you want to spend less on a massage chair, therefore, a good place to start is by considering the features you really want. In doing so you will be able to avoid paying over the odds for features you won’t use and don’t need. It should come as no surprise that massage chairs prices can differ wildly. Some retailers simply charge far more for the same model than other people do. One of the smartest ways around this problem is to use price comparison websites to ensure that you’re getting the best price possible. This is one reason why on this site we use a price comparison feature on every massage chair review. As you’re investigating the range of massage chairs featured you can be confident that you’re seeking the very best price possible. If you’re considering a massage chair not featured on this site then a handy add-on is called Invisible Hand. It works in the background of your computer and checks the prices across dozens of sites. In this way no matter what you’re looking at you can be certain of finding the very best price possible. While using a cashback credit card won’t reduce the actual sticker-price of the massage chair you’re considering, what it will do is give you money back. It’s like a delayed discount. If you search around it is often possible to find cards that offer 5% cashback which, if you’re spending hundreds or even thousands on a massage chair, can really add up quickly and help you to save money. Did you know that there is an active market in second-hand gift cards? Whether you opt to buy your massage chair from an online store like Amazon or in a local “bricks and mortar” store it is often possible to buy giftcards for up to 35% less than you’d normally pay. That’s like buying a $100 Amazon gift card for just $65 – quite a bargain. The best place we have found for buying discounted gift cards is CashCard. Simply search through their currently available offers, buy a relevant gift card and use this to pay for your massage chair. Talk about an instant saving! Massage chairs are like any other product in that new models are constantly being introduced while older (less successful) models get retired. It should come as no surprise therefore that these “end of line” massage chairs can sometimes be bought for less. Don’t be afraid to hunt around for older (or ex-display) massage chairs as you can often land yourself a real bargain and end up paying far less than you would when it was a current model. In our experience Amazon typically offers some of the lowest prices around for massage chairs – but what happens if the price drops after you’ve already bought from them? The answer is that you can get a refund of the difference! According to this article if the price of an item drops within 7 days of your purchasing it Amazon will refund the difference to you or offer a credit for the same value. That’s one more reason why Amazon has become such a big name in online retailing – and it also helps to make sure you’re getting the best deal possible when shopping online.